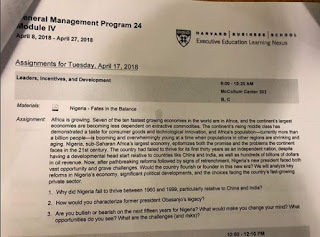 The assignment reads in part ‘Nigeria, sub-saharan Africa’s largest economy, epitomizes both the promise and the problems the continent faces in the 21st century’. 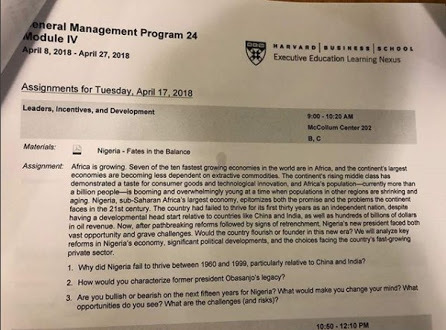 Nigeria has yet again been ‘disgraced’ internationally, following an assignment Harvard University gave to its students in which Nigeria was used as a case study of a failed African country. Africa is growing. Seven of the the ten fastest growing economies in the world are in Africa, and the continent’s largest economies are becoming less dependent on extractive commodities. The continent’s rising middle class has demonstrated a taste for consumer goods and technological innovation, and Africa’s population-currently more than a billion people- is booming and overwhelmingly young at a time when populations in other regions are shrinking and aging. Nigeria, sub-saharan Africa’s largest economy, epitomizes both the promise and the problems the continent faces in the 21st century. The contry had failed to thrive for its first thirty years as an independent nation, despite having a developmental head start relative to countries like China and India , as well as hundreds of billions of dollars in oil revenue.. Now, after pathbreaking reforms followed by signs of retrenchment, Nigeria’s new President faced both vast opportunity and grave challenges. Would the country flourish or founder in this new era? We will analyze key reforms in Nigeria’s economy, significant political developments, and the choices facing the country’s fast-growing private sector. 1. Why did Nigeria fail to thrive between 1960 and 1999, particularly relative to China and India? 2. How would you characterize former President Obasanjo’s legacy? 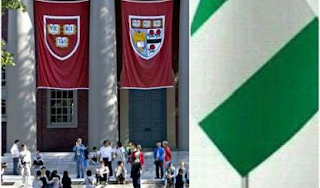 This is coming after a 15-year-old Nigerian girl was offered admission to the prestigious Harvard University in United States of America. Saheela Ibraheem is the 15-year-old daughter of a Nigerian immigrant family living in New Jersey, United States. Since news broke about Saheela’s incredible acceptance to 13 of American’s prestigious Universities, local and International media took interests in the teen’s success story.